Perennial and with woody stems, the Raspberry is of the genus Rubus of the rose family. Raspberry fruit is an important commercial crop that is widely grown in all temperate regions of the world. The most common is bright red in color, with a juicy, tangy-sweet taste. In addition to being eaten fresh-picked, the Raspberry fruit is used extensively in preserves, and a wide scope of baked goods. The Raspberry fruit contains a number of beneficial phytochemicals, making it a delicious and healthful treat. This ever-bearing selection produces a small crop of large, tasty berries in late spring to early summer, and a larger crop in early fall. It additionally adapts well to heavier soils and produces vigorous, rambling canes. 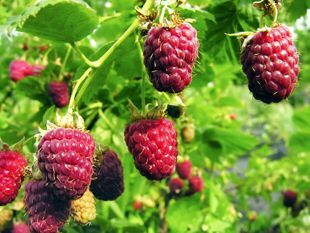 The Indian Summer Red Raspberry fruit is excellent in jams, jellies, pies and tarts.